There are variety of pickles. But my favorite is mixed vegetable pickle. 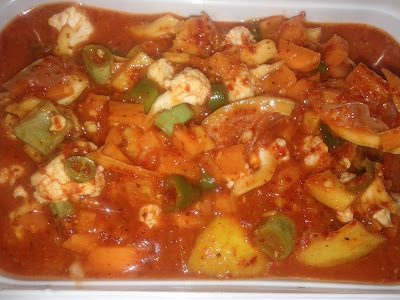 Mixed vegetable pickle is spicy and tangy with lots of vegetable flavours and no oil. You can choose vegetables you like for this dish. The lifespan of this pickle is more than 2 month. Easy and very easy dish that goes well with rice, paej/rice soup, idli or dosa. In Konkani, Nonche means pickle and this dish has a lot of red gravy which makes it look more attractive. 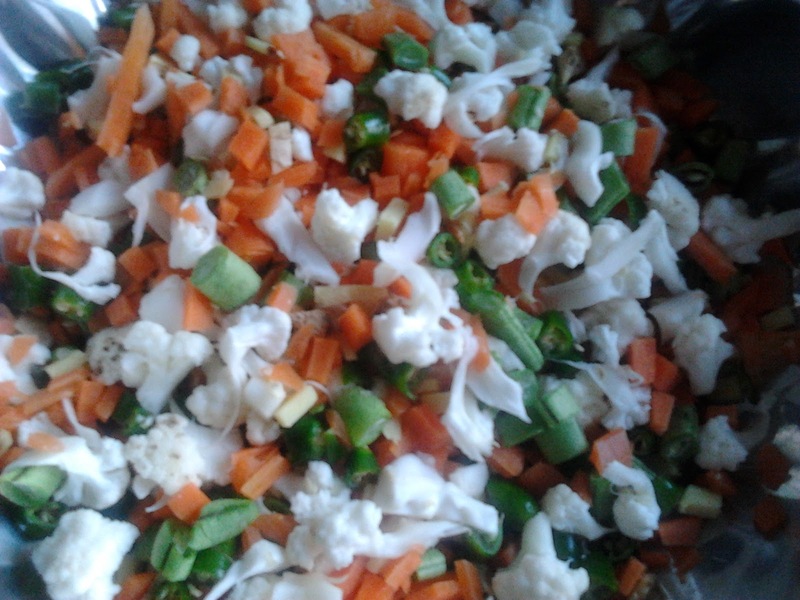 Can add vegetables like beans, cauliflower, green chilly, lemon, ginger, carrot, ivy gourd/tendle and raw mango. Raw mango or lemon skin(keylime) should be fresh and sour. Vegetables should be fresh too. Lemon skin(keylime) should not have it's skin dried. Use green chilly with no black seeds. Make sure that all the bowls,spoons, mixer jar, blender and vessels used during making pickle should be dry and clean with no water drops. The pickle tastes best after 3-4 days once the vegetables are nicely soaked in the gravy. Use clean and dry air tight container or glass jar/porcelain jar to store the pickle and refrigerate it. Be careful when adding salt. Start with less quantity and can be adjusted at the end. Some people make it in 1 day and have it the next day. But I take 2 days to prepare it. First day, I only soak vegetables in a salt water so that vegetables absorb the salt. Next day, I prepare pickle masala/paste and leave it overnight. If you don't want to drag it for 2 days then you can make it in one day leaving 3-4 hours gap between each step. Boil water by adding salt to it for 15 minutes or until you get 2-3 bubbles. Cover the boiled water with a thin cloth and rest till it completely cools(better half a day or 2-3 hours). Chop the above mentioned vegetables and drain the water,pat and dry them completely with no water droplets. Add these chopped vegetables to the salt water and allow to rest for 3-4 hours or overnight. Next day or after 4 hours, drain the salt water from the vegetables into a dry bowl and don't throw the salt water instead make use of it while making paste. Take a clean and dry mixer jar or blender, finely powder mustard seeds,red chilies and asafoetida by making use of the salt water to form a smoother and softer paste. Now mix together the vegetables and paste. Store it in a cool place. Adjust the salt, water and lime juice if needed and keep it covered overnight or for atleast 5-6 hours for the flavors to get in. Pour the pickle in a dry air tight container or a glass jar and keep in refrigerator for future use.